On Playing God – Look behind you, a Three-Headed Monkey! “Populous” (1989) is usually considered the first game that combined all of these elements, but I’d argue the case that “SimCity” (also, 1989), and Sim games more broadly, are closely related. At the core, god games are dynamic simulations that will run without any player interaction – for a while anyway. The challenge for the player lies in trying to make your tribe thrive and grow, which in turn enables you to take over more territory or resources, to grow more, etc. Usually that involves getting access to strategic resources and planning how to best utilize them while dealing with dynamic pressure created by the game. 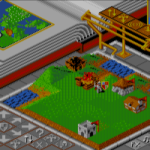 This can come in a variety of forms: for example, the original “Populous” game had the player compete with other tribes, controlled by “rival” gods managed by the computer. 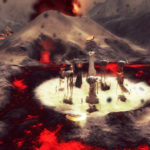 Another example of constraining factors can be seen in the game “From Dust”: here, the elements themselves provide a major challenge, with water and fire constantly threatening your tribe’s survival. The player interacts with this world using supernatural powers. These can be either constructive, as in helping your tribe grow food, or of the destructive kind, as in burning down your rival’s village. However, they are always limited by some resource so that the player is forced to make choices as to when and if to employ a power.